We are continuing to experience some strong near shore fishing on our Fort Lauderdale fishing charters as you can see by the catch pictured here of Will and his crew. 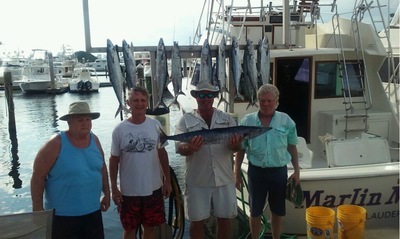 Fifteen Kings and two Wahoo on this trip the first Hoos we have caught since that last moon. The Kings were located in water from 100 to 160 feet and the best bite was just to the north of our inlet. The deep planer rod lines continue to get almost every bite. The Wahoo just off the edge. Lots of bait continues to remain in our South Florida area. South current a mile off the beach for several days now and the water color has been reasonable and for the most part clean. Our weather continues to be pleasant. Morning Westerly breeze almost every day making for a smooth ocean near shore where we have been fishing. If it isn’t West in the morning then it doesn’t blow at all until we begin to see some East later on in the day. Thankfully the mornings have been a bit cooler as no or West wind can make it feel close and too warm quickly if that temperature is up .